Bordallo Pinheiro. LAST CHANCE TO FISH THESE SARDINES! The sardine is always with us. Not only does it fulfil us, but it also presents us with the beautiful sounds of the sea and of the soul of Lisbon. 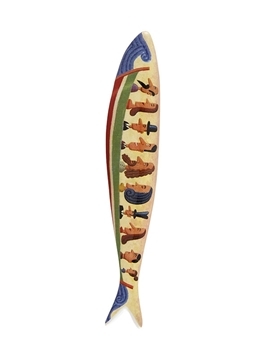 What you can hear in the song of the sardines is endless. Let this magical music break free within you. I always loved stories and characters related to the sea. 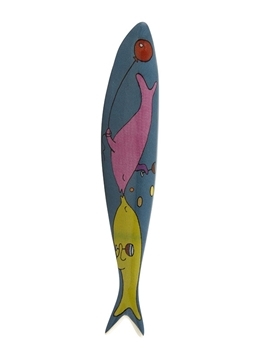 This sardine talks about Triton, the curious fishes and a book of mermaids. Stories about the sea and about love, as deep as the sea. Narciso, with no ceremonies, asks fire to an unwary street lamp. The latter did not spar, remains stiff and silent. What would be our imaginary without Pátio das Cantigas? It wouldn’t be the same, not to Lisbon neither for us. This is a reference to the ships and passengers that every day cross the Tagus from Lisbon to Barreiro for example. They are the truly conquerors of everyday! During the Sardine Festivities in Portugal, everyone goes to the street, and in every corner there’s a music band while sardines are cooked. The entire neighbourhood is full of sounds, joy and smoke smelling of cooked fish. 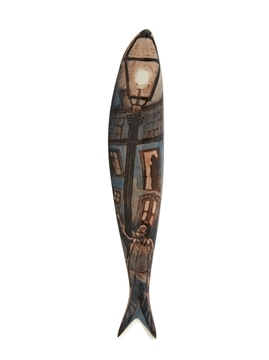 Some sardines also want to celebrate, drink a glass of wine from the Alentejo Region and dance, no matter what will be their final destiny. I asked for an expresso at the esplanade / a glass of water and nothing else / the expresso was quickly done / but what about the glass with the water? /why it didn’t come? Inspired by the famous British Royal Guards, represented by their majestic poses, their instruments and the exuberance of their uniforms. Despite being people, they have already become an attractive tourist spot, likes monuments in the city centre. You miserable fishwife, you ate sardines in the morning and in the evening, you fell in love with a fisherman who was taken by the sea. Sardine! The Queen! To promote the Sardine to Queen, giving her power and sovereignty, was one of the goals. Of hearts, because the heart is symbolically associated with love; in this case, for a city that smells of basil and is kissed by the Tagus. Animals are beautiful natural mechanisms, and Man should serve them and be grateful to them. 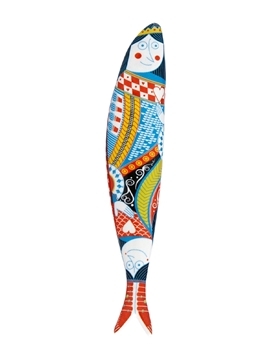 As a tribute, the illustration is a machine created by Man and inspired by the sardine itself. A kind of hospital for fish in danger! 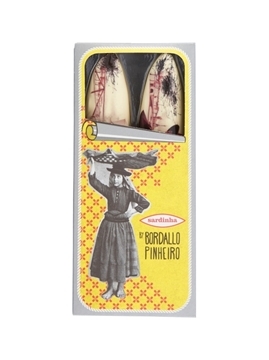 This is Raphael Bordallo Pinheiro, personified in a sardine. With his own style. Relaxed. Focused. A thinker. Creative. Always ready with a pencil. Always with his restless originality. Nothing escapes his eyes. The poor and the rich. Ceramics, journalism, cartoons. Traditions, society, politics... one single artist, full of well-known and hidden talents.